Every Sunday, I get a little excited cause it’s Ice Cream Monday the next day. Well at least there’s something to look forward to for another new week. This is the 4th week, so meaning, it’s been a month already?? 11 more months to go!! Wow, I guess it really passed by very fast. What’s it!!?? IT’s a Lychee and Strawberry Ice Cream. Lychees are kinda in season now and they’re pretty juicy and sweet. But if you can’t get fresh lychee, canned lychees would work well to. This is the 2nd time I’m making this actually. The first time, I made it when I was in Sydney, I think I used canned lychee at that time. Hull and roughly chop the strawberries. Place them in a bowl, along with any juices. Sprinkle 1 tbsp of the sugar and set aside for 30 mins to macerate. If you’re using lychee from tin, drain and finely chop them. If you’re using fresh lychee, peel skin, remove see and finely chop them. Place them with the strawberry. Put milk, cream and remaining sugar in a saucepan over medium heat. Cook, stirring constantly for a few minutes or until sugar has dissolved. When the mixture is just about to boil, remove from the heat. Whisk the egg yolks in a large bowl. Gradually whisk in the hot milk mixture a little at a time to temper the eggs. Then whisk in the remaining milk mixture. Return to a clean saucepan and stir constantly over low-medium heat for a couple of minutes till the mixture thickens and coats the back of the spoon. Do not allow to boil. Strain through a fine sieve and set aside to cool. Transfer to an ice cream machine and freeze according to the manufacturer’s instructions. 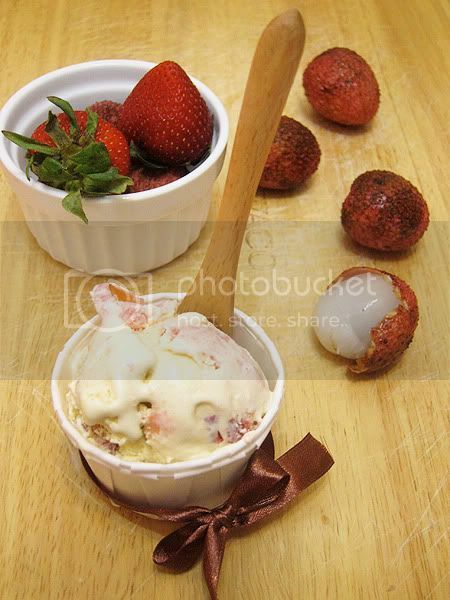 Once it’s churned, pour the ice cream into a container, then fold in the strawberries and lychees. Freeze for 5 hours or overnight. 1. Entries to Project 52 Ice Cream Mondays must be posts written specifically for Project 52 Ice Cream Mondays. This means they cannot be cross-posted in other events. Photos used in the posts however can be submitted to photo events like DMBLGIT. 2. Project 52 Ice Cream Mondays entries should have the goal of easing Monday blues and quite possibly the rest of weekdays. Just as simple as that. * Recipe posts of iced concoctions (Ice cream, Gelato, Sorbet, Sherbet, Shaved Ice, Granita, Semifreddo, Parfait or Frozen Yoghurt) will be accepted. 3. Posts must contain the phrase Project 52 Ice Cream Mondays with a link to this site. You can use this converter to find out the corresponding time in your location. 6. Roundups will be done on the next Monday. 7. You don’t have to submit every week but I will do the round up every week nonetheless. This is so good. I love lychees. I just saw some fresh lychees at Jusco today. But fresh ones are very expensive, I wonder how many do I have to peel to get 1 cup of flesh, without the seeds of course. My fiance has had his eye on an ice cream maker for ages but cos we work in various countries, haven't got round to getting one! 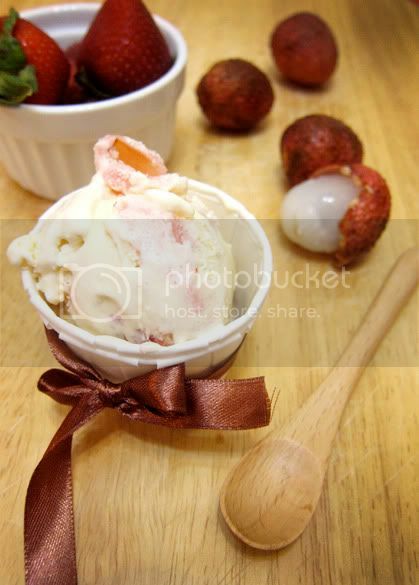 Love lychee and strawberry…. It's freezing here in Sydney. Bookmarked to make it in summer. @Ellie, I certainly do not miss Sydney during winter haha I guess some curry or hot pots would be nice now eh..
Yeah, gotta join you. The next time I make ice cream, I'll pop it in through Project 52 Ice Cream Mondays. 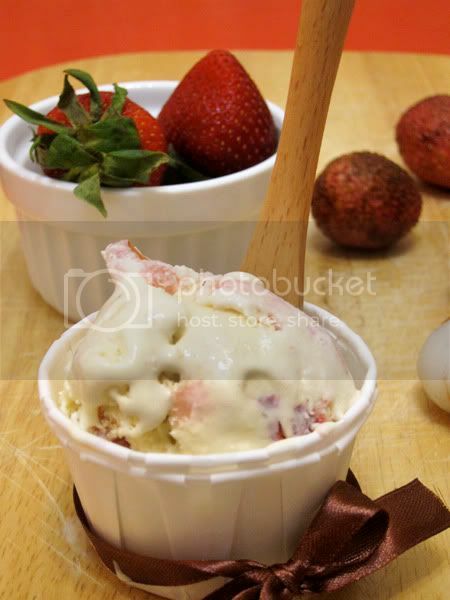 Great looking lychee and strawberry ice cream Swee San! Thanks for hosting! OMG, lychee is my fave fruit and now it's in my fave desert….it must taste heavenly! So great that you are making such "exotic" flavors, will try this recipe out. Can't wait to see the next flavor! That is such an original combination! That ice cream must taste haevenly, mmmhhh!